PRODUCT: VERSI-FOAM SYSTEM-1 SPRAY POLYURETHANE FOAM KIT, CLASS-1 FIRE RATED, 12 BOARD FEET (1 CUBIC FOOT) FOAM SYSTEM, 1.75 PCF FOAM DENSITY, R-7.7. PRICE/KIT. (UPS ground shipment only). Versi-Foam is a high-quality high-density polyurethane foam. The systems come ready to use. No other equipment is necessary. The System is complete with gun, hose, and nozzle. The System 1 is a SMALL sized kit. The density of the foam is 1.75 pounds per cubic foot free rise or 2 pounds per cubic foot in place. The foam will expand six times its original volume and is tack free in 30 to 45 seconds. The foam is 97% closed cell, has an R-value of 7.7 per inch and is recommended for most commercial and industrial applications, including air sealing, condensation control, sound deadening, structural enhancement, tank and pipe insulation, roof repair, marine flotation and gas tank encapsulation, truck and trailer insulation, sculpting and molding medium, pool and spa insulation, and many more. 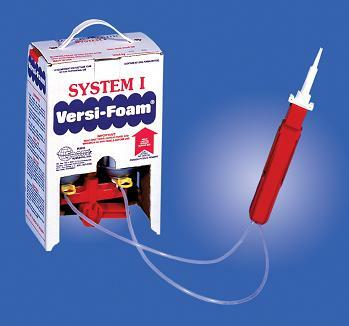 The System Class-1 system 1 is packaged in ONE carton and includes the two chemical components, patented dispensing gun, attached hoses and nozzle. Theoretically, it will produce 12 square feet of cured foam at a 1" thickness, or 11 cubic foot. FIRE-RATED: Evaluated by ASTM E 814* in wood frame pipe penetrations. Conforms to the ASTM C557-93, D6464, CA25-4, and is UL Class 1 (Flame spread of 15, smoke of 20). Closed-cell foam. It forms a water-resistant outer skin when cured. APPLICATIONS: Versa-Foam Class 1 is a high-density polyurethane foam. Commonly used for flame retarded applications such as Cold Storage Insulating and Sealing, Commercial Construction, HVAC, RV Insulation, Roofnig, Truck/Van/Bus Insulation, Metal Building Insulation, Plant Maintenance, Pool/Spa Insulation, Residential Construction, Boat/Marine Float and Insulation, Sound Control, Stage Props Creation, etc. RHH # SYS1NOZ, System 1 Replacement Nozzle. Price/Each.